Pringles Can Arcade Game With a NeoPixel Ring « Adafruit Industries – Makers, hackers, artists, designers and engineers! Grant Gibson created a breakout style arcade game inside a Pringles can. I’ve always fancied the idea of taking part in a Hackathon, but I never seem to be in the right place at the right time. This morning I’m heading from Glasgow to London on the Virgin Pendolino – a trip that takes 4hrs 32mins. I was prepared in advance for this meeting (a rare event) so I decided to throw an Arduino and a few components in my laptop bag just in case inspiration for a project struck on the journey. 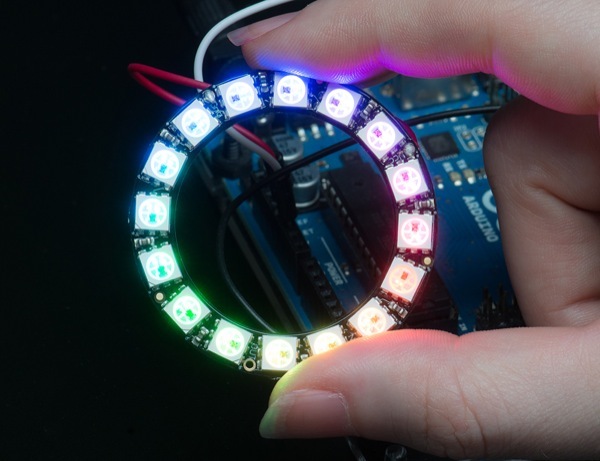 A tube of Pringles at the station gave me an idea: build a simple game, controlled by a single rotary encoder using the Adafruit Neopixel ring I had in my bag. Without any tools I knew it would be a real ghetto hack, but that made it all the more fun.